Meh, Tekken Zaibatsu is effort. I like him b/c he was the first character I was able to pick up really fast. He's a unique character and I liked all of his different style moves. Well, i've played him all along, but he really first became my truthfully main in the end of Tekken 4. Yoshimitsu was just... He was diffrent from all the others with all of his teleporting, spinning and so forth. I just fell for him ever since the beginning. But, ashamed as i am to say this, i haven't played him too much lately. Marduk is taking up much more of my time. Yoshi' remains my main and my best character, but Marduk, i believe earn a second place. Though - he's not too great in the hand of me - yet! 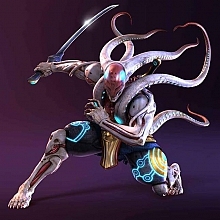 Yoshimitsu remain - no matter what! UnknownDNA : WHy i play Yoshi'? That's one thing about which I don't have to worry; I've been playing Yoshi so long that my instincts are practically hardwired to Yoshi. It'd be too hard to adjust to another primary. @tora: you must be like a robot when you play tekken then. Heh. Well I do have certain set routines (and subroutines)...but when you fix your reactions to certain moves for a long period of time, your reactions stay that way. Perfect example: I had been playing SC3 for a long time, and then when I tried to go back to Tekken for a bit, I kept trying to do b, b, 2+4 for Yoshi - in other words, his 66+B+K from SC3. Or, before I got used to SC3, I'd be trying to do Yoshi's T5 f+1+2, but in SC3. It happens. Whenever I play anybody, really, one of my reactions is to do f,f+4, regardless of what the move is. I think you all know why. f,f+4 is the move I really spam with yoshi I just think it's useful, when you are in a tight spot. and you lot have just been givin a tip there so use it. Fubuki is me second favourite poek move. My first favourite is d+f+4. It kinda pops out of nowhere. I ;like it. nah my favorite move is b+1+1+1+1.